There's been a hint of sunshine recently which meant taking the opportunity to do another OOTD. It's 'show-your-legs' season but unfortunately, it hasn't been hot enough for me to substitute my trousers/leggings/jeans for shorts and skirts. THE DAY HAS FINALLY COME. I couldn't detach myself from the black and white choice of clothing yet but I was willing to compromise and added a splash of colour to my look today. I jumped on the bandwagon and wore this black Bardot from Topshop (Bardot's are very in right now!) This has been very flattering on everyone since it goes with everything I find myself wearing this a lot. This was paired with a patterned skirt from Zara. I love how the skirt makes a bold statement and removes any simplicity from the outfit. It's not wholly floral but the unique design makes it stand out and eye catching. Its has zips on the side too! Also, I like how light (and thin) the skirt is. In the past, skater skirts that I purchased tended to be made out of a very thick material thus, it's heavy. It adds extra weight and I certainly don't want to feel like I'm working out my stomach and legs when wearing a skirt. I've found a newfound love for flats as I've recently become a 'comfort over style' enthusiast. Though, I still love design and detail so I try to avoid anything too plain. Thus, I opted for these brown H&M flats with a gold bar (I actually just noticed that my watch matched my shoes). These are the comfiest flats I've ever worn, I often choose these pairs of flats if I'm going out shopping or when I know I'm going to be walking around a lot. Take note that you should never wear new pairs of shoes (whether it be flats, sandals or heels) when you're out on a big shopping spree. I couldn't avoid getting a blister from these flats when I went to Westfield one day; I didn't realise that I had to break them in first. 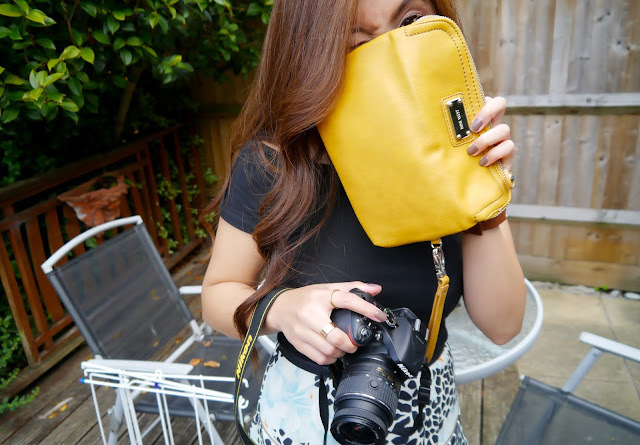 In an attempt to add more colour, I carried this cute yellow clutch bag from Nine West. I needed something lightweight but is still able to contain my essentials. Although, this has proved to be more useful when clubbing than on a regular day out. As you can see I've been learning how to work out this new camera. I finally know my way around it! So hopefully that means more posts for you guys.